Eight Harrang Long Gary Rudnick P.C. 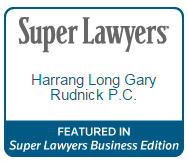 (HLGR) attorneys in have been named to the 2016 Super Lawyers or Rising Stars lists. Super Lawyers are selected through a process that identifies outstanding lawyers in dozens of practice areas. Factors considered in the nomination and peer evaluation of potential Super Lawyers include education and employment background, experience, representative clients, pro bono and community service, and honors and awards. About Harrang Long Gary Rudnick P.C. Harrang Long Gary Rudnick P.C. (HLGR) is a law firm founded in 1957, with offices in Portland, Eugene, and Salem, Oregon. HLGR attorneys assist a wide variety of individuals, businesses, and organizations with legal advice, business transactions, litigation, appeals, administrative proceedings, and government relations.